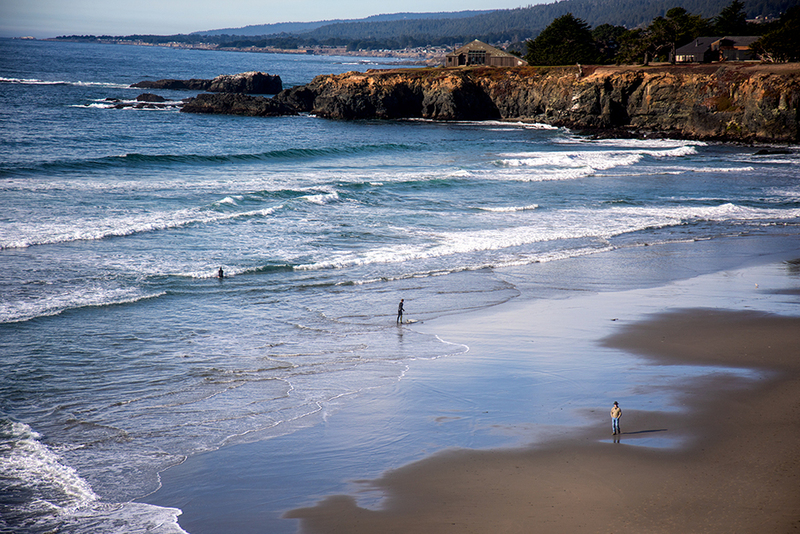 A mystical 10-mile stretch of California coast and extends about 1 mile inland. With trails leading out to salty cliffs that are alive with nesting birds, sunning harbor seals and wind swept sculptured the cypress trees. There are miles of hiking, biking and horse trails and a Scottish-style golf course. Watch watched migrating gray whales breach the surface from Walk-On Beach. Located 2 1/2 hours from San Francisco this secluded unspoiled swath of California coast — bordering Sonoma and Mendocino Counties. All of the beaches on the coast of The Sea Ranch, like all California beaches, belong to the public. The public can access the beaches at specific points without trespassing on private property. Along Highway 1 at the mile markers indicated, you will find public access parking maintained by Sonoma County. Parking is currently $7. Restrooms are available. From each parking area, you walk a trail to the beach. Walk-On Beach: Wheelchair and stroller accessible, but it's a hard push through sandy spots; a sandy beach. Mile Marker 56.48. Please Note: The public trail to Walk-On Beach is currently closed just north of the beach, due to a collapse of the trail. There is no public access to Walk-On Beach until the trail can be repaired. Benefits available to members, guests and renters are access to The Sea Ranch Library, Outdoor Recreation Areas, Moonraker Recreation Center, Ohlson Recreation Center and Del Mar Center. Please Note: All Sea Ranch roads and most trails are private. Visitors not staying on The Sea Ranch must park in the public access parking areas on Highway 1 and stay only on the public trails and beaches. If staying at The Sea Ranch, be sure to display the tag supplied by your rental agency on your vehicle's rearview mirror or dashboard, or your vehicle will be subject to citation and immobilization. The self-guided Audio Walking Tour explores elements of the first area developed at The Sea Ranch with one of the founding Sea Ranch architects, Donlyn Lyndon. The tour will include views and discussions of Condominium One (now on the National Register of Historic Places),the Hedgerow Houses, the iconic Sea RanchMeadow, The Sea Ranch Store and its expansion into the Lodge, and Moonraker Recreation Center. You can download his commentary from The Sea Ranch website on your smart phone. Condominium One designed by MLTW (Richard Whitaker, Donlyn Lyndon, Charles Moore, and William Turnbull) received the AIA’s 25 year award and is is also on the National Register of Historic Places at the national level of significance. Condominium One was constructed in 1965 and is one of the most significant landmarks of post-war American architecture. Revolutionary in design and widely imitated, Condominium 1 helped redirect the course of modern architecture around the world. "Buildings were meant to be like geodes, ordinary rocks on the outside with the inside going gangbusters". "Our most difficult task was to find a way for people to inhabit this magnificent and natural system in numbers without destroying the very reason for people to come here". "The Sea Ranch Concept is not about a ‘nice place to live.’It’s about a unique place to live, unique in its vision and its intent to build a community dedicated to a common effort, an effort to protect and preserve the natural character of a remarkable beautiful and appealing place." "One of the fundamental tenets of the philosophy that has guided the development of The Sea Ranch is that the landscape of bluffs, meadows and forest creates the special character unique to this community and should dominate all human endeavors. The siting and design of buildings and their accoutrements should be responsive to, and in harmony with, the landscape." A compelling examination of the complex processes involved inside our planet which began eons ago. 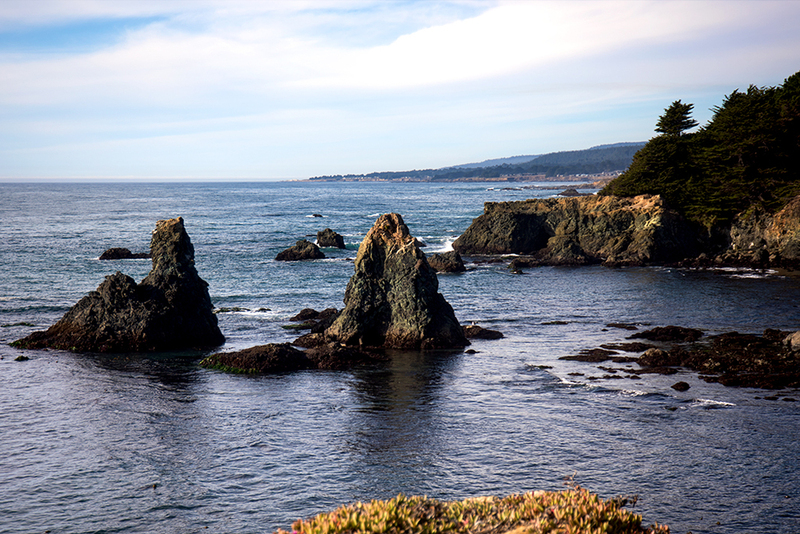 With an introduction to “Deep Time” and the Geologic Time Clock, geologist Thomas Cochrane provides a detailed yet approachable overview for the layperson of how and why the Sonoma-Mendocino region’s coastline appears as it does today—with all its fascinating oddities. . Available at these local retailers. Explore nature at your door when you stay at this Sea Ranch oceanfront retreat perched atop a scenic bluff. This classic oceanfront 3-bedroom, 2-bath vacation rental sleeps six guests. You’ll find Abalone Bay to be perfect for a romantic getaway, girls’ weekend, gentlemen's holiday, or relaxing retreat. Abalone Bay is dog friendly and welcomes anglers and divers. Click here to book your stay at Abalone Bay.